My son, who is 1, adores the washing machine when it’s on, and turns it off mid-spin. He loves watching us cooking and would try to grab the pans himself. He is mesmerised by the hoover, which he will try to eat. He loves birds, and our cat, especially her tail. The cat doesn't like the fact her likes her tail though. He has the uncanny ability to get into awkward spaces, with corners and edges, as soon as you rest your eyes on your (cold) cup of tea- I haven’t had a hot one since he was born. He likes pulling cables and tries to climb the fire guard. He will reach up to anything dangling off any dangerous high surface. He will protest and stiffen his body when I need to change his clothes or put him in the car. Oh what about changing his fluffy nappies well, let’s not go there but the TotsBots Easyfits are definitely our favourite for quick changes! He can splash most of the bath water onto the floor within minutes of getting in. He tries to get into the TV and behind the piano. The washing... he likes helping, in fact he hangs it up for me, all over the hall, the hallway floor. Dry or wet. 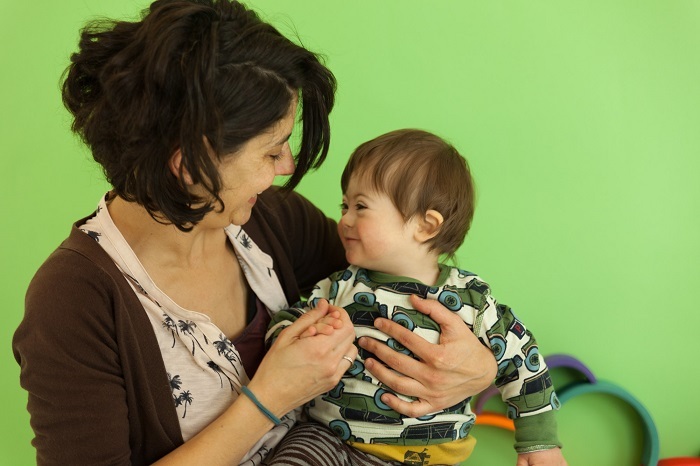 Oh it’s tiring raising a 1 year old... but what about his Down’s Syndrome? Oh that’s ok. When he arrived, our journey expectations changed, instead we jumped in his beautiful, vintage car. We may not drive on the motorway with everyone else, but that’s ok, we’ll get to see the scenic route. When you go a bit slower, you realise how much more there is to appreciate in the little things. Or how much more rewarding it is reaching the different milestones along the way.